I bought this laptop to play some older games. It has 2 graphics cards: a Radeon HD 8790M, and the Intel Graphics 4600. While playing Half Life 2, after about 15 minutes, the laptop shuts off. Looking in the event logs, it shows "Thermal Critical Temperature Shutdown". I ran the internal Dell diagnostics with no issues. 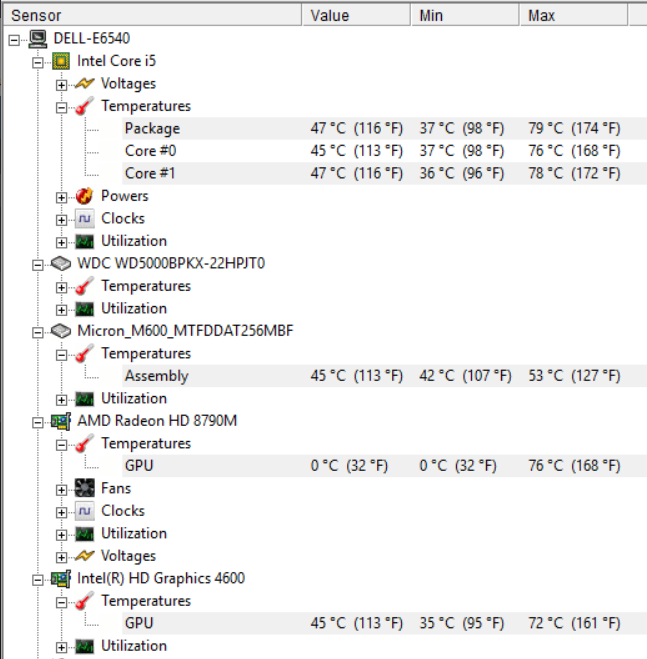 I noticed that the temperature got up to 80 deg C. There is no option in the BIOS to change the fan speed etc. Reading on line, suggestion include taking the heat pipe off and replacing any pad or thermal paste that has been installed. Some suggested getting a copper shim (https://www.ebay.com/sch/i.html?_from=R ... cat=175673) for the gpu. I thought this Dell would be good for playing some older games like Half Life 2. It has windows 10 and 16 gigs of ram. Am I wasting my time trying to improve this by lowering the gpu/cpu temperature with this fix? The fan area is clean as I took the cover off and looked inside. Looks brand new. 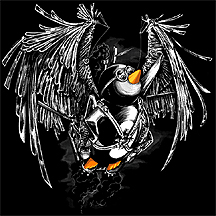 While playing, the ATI software gives you the option of running on that card with games or other graphic software. Is the Intel 4600 a junk card to play on? Maybe running on that card will prevent the thermal shutdown. Have you tried blowing out the vents with some canned air? I'm a lot more familiar with disassembling laptops than you are and I would be very hesitant to mess around with the heat pipe. On the other hand, Dell does give you detailed disassembly instructions if you go to their support page. Yeah it's very clean. I've blown it out anyway, but like I said it's very clean inside. The person that I bought it from did not use it that much. 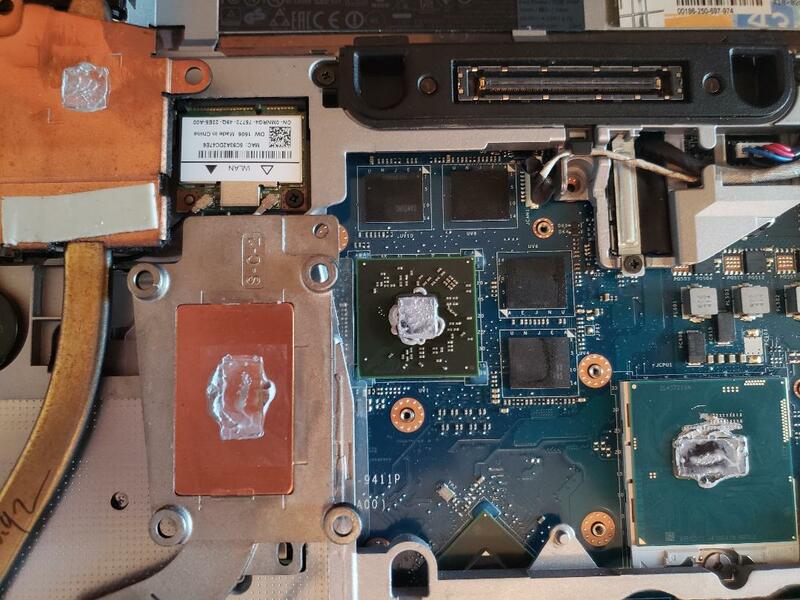 I'm guessing that since this is an older laptop, about 4-5 years old, it probably needs to have the heat pipe removed and redone with thermal paste. Its rare but the working medium from the heat pipe could have leaked out / evaporated and is no longer working. I remember that the ATI cards tend to run hot. I had one where it would swithch between the on chip and the add on for no apparent reason. My dad is/was having a similar issue on his laptop - no gaming at all, but thermal shut down after 30 minutes or just a random. I told him to bllow out the vents as best he could, and also to try pulling the battery completely since those get whacky sometimes when the get older. With that king kong stand, I can't see why you would have any issues except for a possible heatsing bust. gl. What kind of medium is used in the heat pipe? I'm planning on pulling it off this weekend to take a closer look. I could also just purchase a new one off of ebay that includes the fan etc. Maybe the thermistor is going bad. I read that the thermistor is inside the fan assembly. ifixit notes the cooling issue. You should repaste and shim. I think it would be best to underclock your CPU/GPU by 100 to 200 MHz if the issue persists. However, I don't know of a utility that will allow you do so. It would be well to have a replacement heatpipe/fan assembly on hand. I don't know how hard there are to get into but if it requires disassembling most of the laptop, you may as well replace the fan. The only other thing I can think to try is to drill larger holes in the case for the intake side of the fan. Thanks for the info Err. I haven't done anything yet, but I did remove the heat pipe. Conclusion: does not look like a very good application of compound, and it's all over the components. Yeah, you might get lucky with proper application of some quality heatsink compound, and take the opportunity to clean it real well now that it's open. NOTE: Never let the fan spin when you blow it out, if you can help it. Jam it with your finger. You can get the RPMs WAY higher than the bearings are rated for with a blast of air and damage them. That's enough compound for 5 laptops. I'm glad it looks fairly easy to access. In my wife's 1520, I had to disassemble the entire laptop to replace the fan. After redoing the thermal compound, I was able to play for 30 minutes with no issues; however, I do have a question. I used Artic Silver tube that I've had for a long time. Does this stuff go bad over time? My guess it's probably 10 years old. I could not find any info on line, but several users report that it should be okay as long as it has not separated. I also removed the dust cover that is underneath. Seems like it was really restricting the air flow. Do those temps look okay? I could try to mount a low profile heat sink on top which might help. I've had Arctic Silver sit around for easily 10 years. Seems to stay stable if it's kept out of extreme temps and the cap is on tight. Those temps are a little on the warm side for my taste but as long as your not shutting down or throttling your processor, you should be okay. This Utility will tell you everything you'll need to know about your CPU. It will also list the temp limit and run a stress test. I also found a utility called ThrottleStop. It's intent is to prevent throttling of the CPU but you can also use it to underclock. If you keep getting system shutdowns, you could try underclocking the CPU by 100 to 200 MHz. Be careful and don't go the other direction. I've been googling that laptop and it's notorious for overheating. Opinions are that the cooling system just isn't adequate for thatvprocessor in combination with that GPU. But that sloppy factory heat sink compound application of sure doesn't help either. Thanks fellas. From the looks if it, that does not look like a factory application, as I suspect that they use a thermal pad instead of thermal paste. Even the link you supplied FP shows the thermal pad. I've never been a fan of the thermal pads. I'm probably going to order a spare, and mod this one a bit. I have some really small low profile heat sinks that I've had for a long time. I may experiment with adding some on top of the heat pipe. Is there are reason why the top of the heat pipe is black, while underneath it's not?